GE Marine Exhibit by Idea International, Inc.
Maritime/Air Systems & Technologies (MAST) with its focus on naval platforms, systems, and technologies, is an important show for GE Marine Solutions, the division of GE dedicated to power and propulsion systems for customers in the workboat, merchant, offshore and naval industries. GE Marine manufactures medium-speed diesel engines, coupling smart engineering with software analytics. More than 15, 000 engines are in operation worldwide so MAST’s global audience is an important target for GE. 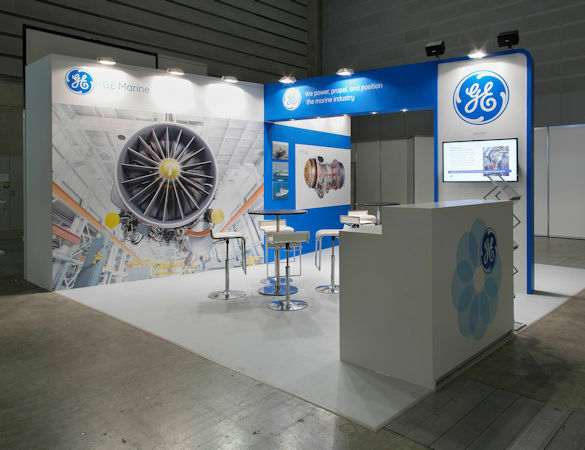 This 6m x 6m exhibit features, among other things, a cutout of the GE engine on large format graphics, and casual seating for meeting with this important audience.